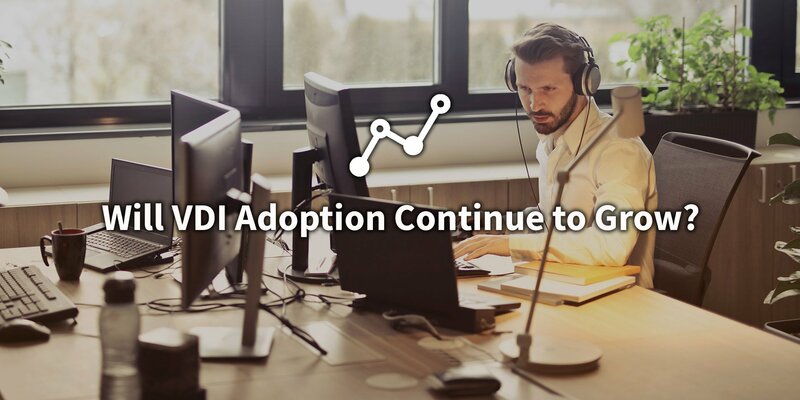 Will VDI Adoption Continue to Grow? Virtualization will continue to grow as we head into the 2020s. We can also expect to see the adoption of VDI grow, as well. This is true not only thanks to VDI technology but also thanks to the evolving DaaS market. The convenience, flexibility and cost savings that DaaS allows makes it easier than ever for organizations of all sizes to overcome the high entry bar required for VDI. Now virtually any business can reap the management and cost savings benefits of VDI thanks to Cloud based desktops. The adoption of Virtual Desktop technology is expected to grow. In fact, it is expected to grow at a CAGR of 11% through 2021 (Technavio). This may surprise you given VDI technology has been around for decades. But the reason for its continued growth is in part thanks to our growingly flexible and remote workforce. “Workplace flexibly and business agility is a key factor spurring growth” reads the report. Workers today must often access their apps and data at home or on the go. They bring personal devices into work, or work from their own devices at home. Businesses and organizations need a solution in place that allows them to do all of this cost effectively and efficiently. This solution is VDI. Desktop as a Service or Cloud desktops is another trend that is expected to explode. In fact, it is expected that DaaS use will grow by 40%, according to Technavio. DaaS is a form of end user computing where the desktop is hosted in the Cloud instead of in your on premises server. It is very similar to Virtual Desktop Infrastructure –the main difference being that, in the case of DaaS, the server infrastructure is not on premises and managed by company or it’s IT staff – it is instead housed offsite by a third party, Cloud service provider in their own data center, and the Virtual Desktops are “rented” out on demand. The advantages of DaaS stem from this offloading of the burden on the organization or company and putting the full weight of maintaining and hosting VDI on the Cloud solution provider that already specializes in maintaining their own servers. With DaaS, you are effectively able to boost security, reliability, and performance across your network without investing extra IT staff hours into an on premises server. By providing Cloud-based desktops to employees, DaaS turns the endpoint device into a conduit for the desktop hosted by the Cloud provider. This means that all data and apps are securely stored not on the device itself, but in the Cloud. It almost goes without saying that IoT technology is expected to grow over the next few years. Billions more devices are expected to be connected to the internet by 2020 –as many as 200 billion, some say. This creates a big opportunity for virtualization technology. As proven by Stratodesk, VDI and IoT management systems can converge to provide innovative solutions. In fact, Stratodesk’s automated management platform, NoTouch Center, is the first solution for both VDI and IoT endpoints in the same pane of glass. With such explosive growth, you can expect to see an increase in the demand for EUC solutions. Enterprises require an endpoint OS for their growingly complex network of devices. This OS will need to power many different devices. It must transcend make, model, or manufacturer. And it will need to connect to a powerful, automated management solution. This management solution must be able to set groups, manage user roles and more –all for a network of diverse endpoints. This gets tricky. Most management solutions are limited when it comes to what kinds of devices can be managed. A management solution that manages x86 devices, for example, might fall short in managing ARM based devices as well. Stratodesk is perfectly poised for the explosive growth anticipated across IoT, VDI, and DaaS markets. Able to connect to your preferred VDI or DaaS environment directly out of the box, Stratodesk is the easiest to use and most secure option for system admins and IT managers. It helps you save costs and gives you the full benefit of your VDI and DaaS deployment while also unlocking new potential for enterprises by harnessing the power of both x86 and ARM based, VDI and IoT devices in the same environment.